Astrogeddon is a high-speed, asteroid-blasting arcade game which fuses old-school gameplay with new-school cool. The game features fully rendered 3D graphics, 360-degrees freedom of movement, huge explosions, a wide range of power-ups and more than 20 types of enemy spacecraft, spread over a massive 100 levels. Microsoft Windows 98, 2000, Me, XP or Vista, 7 or 8. Microsoft DirectX 8.0 or later. 128Mb RAM and 32Mb free disk space. THE PLOT: An alien armada has swept the galaxy, laying all to waste. Diplomacy has failed and New Earth is under attack. Star Fleet has been destroyed and you are our last remaining hope. Every time you are hit, your shield will be depleted. If it runs out, you lose a ship (you begin with three ships). You can regenerate your shield, collect new ships and boost your firepower, by collecting the power-ups released from the wreckage of enemy craft. Press the 'Pause' key to freeze the action, or 'Esc' to exit. You start with a low-powered single shot laser gun, but can boost your firepower by collecting the orange cross-hair power-ups. 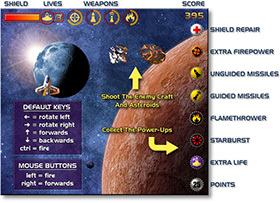 Your current firepower is indicated on the matching cross-hair icon at the top of the screen. Don't waste your shots as your firepower will steadily decrease the more you fire. These missiles launch two at a time, always along a straight path. These launch one at a time, from alternate sides of your ship, and always home in on the closest enemy craft to their initial direction of travel. This a very powerful weapon, but it burns out quickly, so use wisely. It is particularly effective against enemy craft fitted with shields. If the spinning background makes you spacesick, switch it off via the Options/Graphics menu. If the game is too easy or too hard, try changing the difficulty level. On the easy level, your ship will be able to take more hits, but you will be awarded fewer points. To succeed, you MUST collect power-ups, but only collect the ones you need: ignore shield and missile power-ups if you are already fully loaded and only collect bonus points if it doesn't put your ship at risk. Try to stay in the centre of the screen - you'll have more time to react to approaching danger. If your ship is hidden off the edge of the screen, don't hang around waiting to be hit - take a chance and just accelerate ANYWHERE. Prioritize your targets - eliminate the most dangerous enemy craft first! Keep the number of asteroids on the screen to a minimum by picking off the larger rocks one at a time: shoot one large rock, shoot all the smaller rocks released, and only then shoot the next large rock. Some of the alien craft home in on your ship. You can confuse them by moving off one side of the screen and appearing on the other. If an alien craft is attempting to chase or shoot you, the safest place to be is usually behind it! Some alien craft are protected by shields. The flamethrower weapon can penetrate shields, but if you only have laser shots and missiles, you will have to attack through the gap at the rear of the ship. If you encounter any problems running Astrogeddon, see our Support Page.